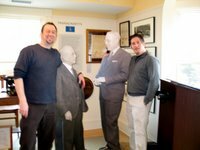 My visit to America’s Credit Union Museum. Last week I was on vacation in Boston with my wife, Amy, and son, Ivan. It was a very nice trip – we visited the aquarium, zoo and children’s museum. I had a coffee with my friend Ron Shevlin. We saw lots of friends and family, including my cousin Tiven Weinstock, a sometimes commenter on my blog. 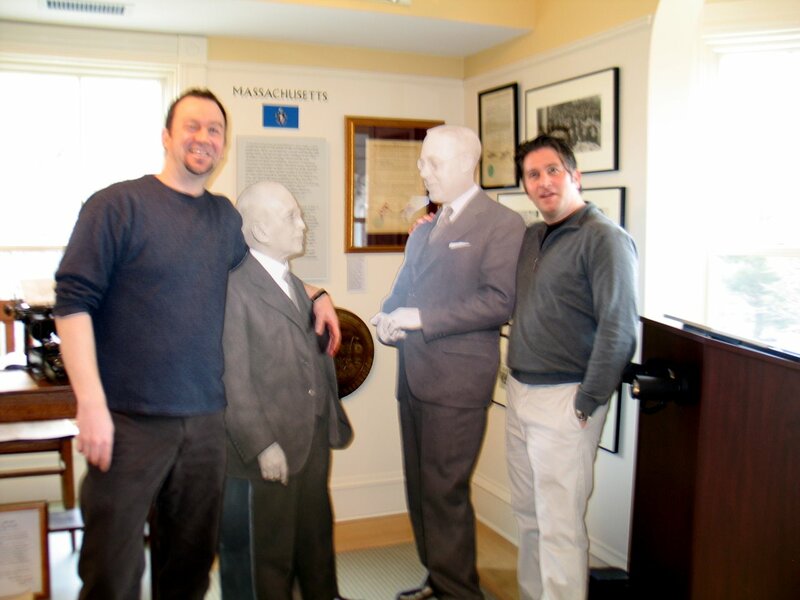 On Thursday, we drove up to Manchester, New Hampshire to meet my friend Morriss Partee at America’s Credit Union Museum. 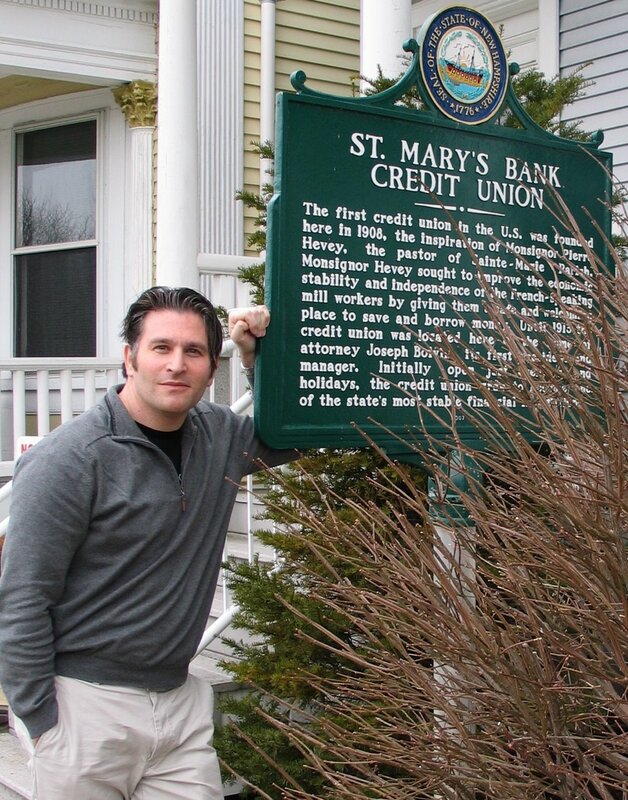 Yes, I know, how incredibly credit union geeky of me (I know, I know…). But I’m glad I went, it was well worth my time. First of all, it was incredibly kind of them to open the museum for the two of us (my wife and son went to the nearby Manchester Science Museum, and who could blame them really). We had a great guided tour by a volunteer named Gloria. 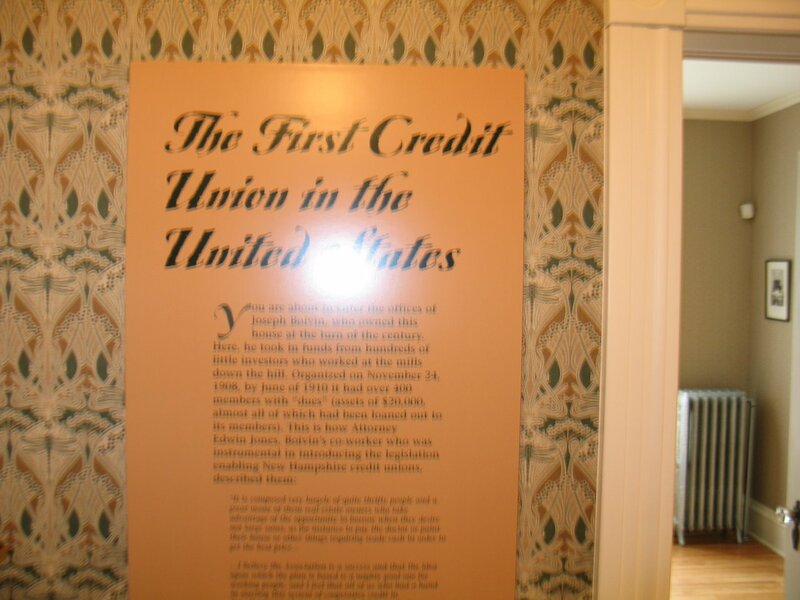 She explained that the museum is in the house where the first credit union in America was founded. 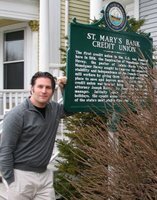 It was founded thanks to three people who saw a need for the local mill-workers to save their money safely and get access to affordable credit: Monsignor Pierre Hevey of the nearby St. Marie’s Church recognized the need among his parishioners; local attorney Joseph Boivin was the first president of the credit union and allowed the CU to operate from his home (his home is where the museum is today); and Alphonse Desjardins, who led the creation of Canada’s first credit unions (Caisses Populaires Desjardins) in Quebec, advised on the project. There is something touching about the museum – it’s history and simple, honest roots. It is emblematic of local community members coming together to pool their resources for the common good. And it is that common good which is so easily lost as communities grow, and local organizations gain a vested interest in their own growth and existence, sometimes totally divorced from the initial community needs that spawned the organization in the first place. Afterwards, Morriss and I got into a great conversation about the role of CUs today. I am sorry we didn’t get more time to finish our conversation. In my three and a half years in CU-land, I have been torn between really believing in credit unions as a vital democratic form of financial institution and, well, just not really caring all that much. Clearly today’s financial crisis proves we need ethical and responsible places to conduct our financial business. FIs rooted in long term thinking, and not just out for the quick profit. Many in the CU movement believe CUs are superior to banks from this point of view. And on a certain level I agree with this. When your profits go to shareholders, you can more easily become corrupted and lose sight of equitable business practices. But I also believe there are lots of incredible banks out there doing great work (ShoreBank anyone?). I’m not sure what is gained from pitting CUs against banks, we’re just alternatives that in most cases are too subtly different from each other for any regular consumer to really know the difference. Perhaps we just need a Goliath to make us feel more like David (I think Morriss wondered that aloud, but I’m not sure if I’m quoting him correctly). I know in the CU world the bank versus credit union debate is a big one, but I’m not so wrapped up in it. 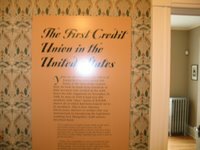 It was very interesting seeing the birthplace of the American credit union, and I recommend anyone in the credit union movement/industry/system to visit it if you’re in New England. Actually, scratch that, anyone in the entire financial services industry should pay the museum a visit, because ultimately we were all born out of a need, still incredibly relevant, for people to access savings and credit vehicles. We should not be in business to serve our own needs or make shareholders wealthy, we should be there with solutions to basic consumer needs. Solutions that work for the common good, where it isn’t about profits, nor about charity, but about service, as a sign in the first room of the museum says. I don’t think credit unions have a patent on that concept in the FI world, but being a co-operative helps CUs stay grounded in that concept. In my experience, it is mostly CU people who struggle with that debate and feel a sense of connection to the roots of community banking. And perhaps that, in and of itself, speaks volumes about the heart of the movement. About a week ago, Morriss Partee blogged this: Social Media Marketing Best Practice: Use multiple media. In this post, he tagged me, along with a few others, to continue a topic of Social Media Marketing Best Practices started on the Twist Image blog by digital marketing guru Mitch Joel. He asked me to continue this thread by adding my two cents, so here goes. I used to call it Web 2.0, but that seemed to focus too much on technology. So I started calling it Social Media, but I think that focuses too much on the tools and leads us to jump to solutions before we fully grasp the issue we’re trying to address. Now I simply call it Community Engagement. The most important thing is to never lose sight of our core objective: People. We need to keep the people we’re trying to engage in a conversation front and centre, and develop a plan to inspire participation around a relevant topic, event, issue, brand, product or service. I hope this thought furthers the conversation a little. Great time at CUES Experience. Got home today, and I’m just too tired to write anything even semi-salient right now, but Tim managed to do that, and I think he got even less sleep than I did. It was great seeing so many amazing friends, and meeting some great new people. Quite a whirlwind. 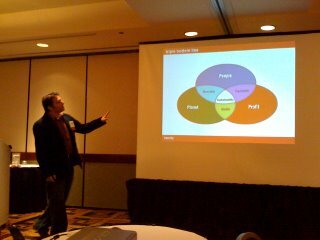 And thanks to Morriss for snapping this pic of my presentation (with his iPhone no less)! I’m off to Minneapolis tomorrow for CUES Experience. I’m excited to see so many of my CU alum there, including Morriss Partee, Tim McAlpine, Robbie Wright, Denise Wymore, Brent Dixon, and am most excited to finally meet Ron Shevlin, Steve Williams and Christopher Stevenson in person after months of being eConnected. I hope I didn’t miss anyone – did I? I’m presenting a Credit Union case study from Vancity, covering who we are, how we show up and how we leverage social media. Should be a good presentation. It’s also been a fantastic way to procrastinate finishing my chapter for the new Age of Conversation. Truth be told, I’m starting to panic, it’s due in 3 days. If you’ll be in Minneapolis, please say hi. Now I gotta figure out how to transport fresh fruit across the US-Canada border, because my son Ivan is expecting tiny apples from a place called Minneapolis (say it aloud). Come on down to BarCampBank BC. 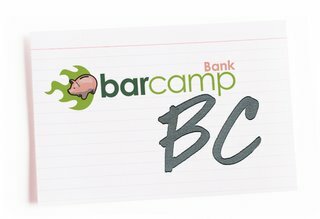 I’m excited to announce that on September 20, 2008 BarCampBank is coming to Vancouver. Gene Blishen, Tim McAlpine and I are putting a stake in the ground, after talking about doing it for some time. What if we changed banking and finance? The aim of BarCampBank is to foster innovations and the creation of new business models in the world of banking and finance. The first one in North America was in Seattle last July, and it was a truly transformative experience. For me, the ideas, relationships and bonds formed in those two days are invaluable, and the memories of it are strong and very good. Lots of details to be worked out, like an exact location, but it will take place on September 20, 2008. The cost is always break-even (think $25 CAD), so its worth the travel expense for my East Coast readers. Go to the wiki page to add your name to the list. It will not disappoint! PS: Thanks to Morriss Partee, whom I credit for keeping BarCampBank alive and kicking in North America. Thanks Morriss, looking forward to seeing you here! Also, I believe it was his idea to create something with the acronym BCBBC. Who couldn’t love that! NOTE: My original post accidentally said that this was on July 20th. It is, in fact on September 20th!